Information on managing pasture and feeding pre-mating to ensure optimal cow nutrition after an event like snow. If not you have a deficit. If you have an estimated cover of 1700 kg DM/ha (going into 2100-200 kg DM/ha cover and leaving residuals less than 1400kg DM/ha, stocked at 3.0 cows/ha at 18kg DM/cow/day you need 48kg DM/ha to meet demand. The predicted growth rate (including nitrogen that has been applied since the snow) is 35kg DM/ha. Therefore you are in a feed deficit. Note that if on a very fast round residuals maybe 1400kg DM/ha or more. However, very quickly APC will drop and pre-grazing covers will be lower - not a good situation to be in at mating. Which describes your current feed situation? 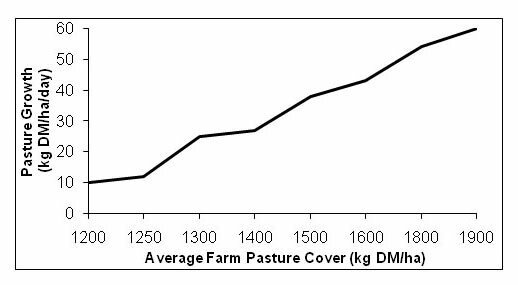 Figure 1 shows how low average pasture cover (APC) results in limiting spring pasture growth rates. 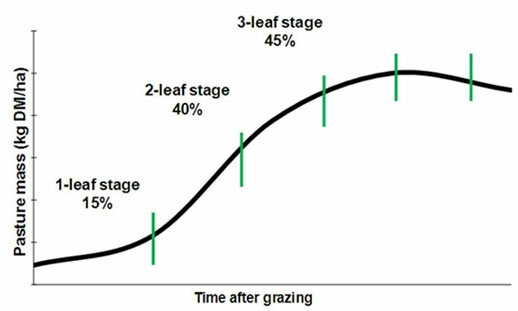 The lower growth rates are due to the pastures being grazed before the 2-2½ leaf stage. Plant growth rates are maximised by grazing before the appearance of the fourth leaf or canopy closure (whichever occurs first) as shown by Figure 2. If have low APC then need to get rotation out to at least 25 days The quicker the rotation the longer the time in a feed deficit. Monitoring APC and residuals will be critical to ensure supplement feeding stops before creating a feed surplus. If in doubt stop feeding. Assess your situation, seek advice and plan - this reduces stress and time making decisions. Review plan weekly. If you take action now your feed position can change very quickly. 16 hr milking maybe an option to manage workload with little impact on milk production. Add magnesium to silage, PKE, grain. Add limeflour to milkers only if feeding high rates of grain. Seek advice on spring fertiliser as due to the very wet spring other nutrients (sulphur and potash) may be limiting when conditions are drier and warmer. Good feed if able to source especially if feeding grain as forage feeds reduce risk of acidosis. Likely to be expensive however, supplement should only be required for short period and if animal health (acidosis) or animal welfare are at risk cost differential not a factor. Quality can be highly variable especially with cereal silages, consider this when purchasing and feeding out. To get intakes of 3kg PKE/cow plus, cows need to be fed adlib and access to water and have enough bins to give all cows a chance. Can get mixes with grain (70%PKE; 30% grain). Need to ensure well mixed to prevent gorging and acidosis with the grain. Need to feed so that individual cows don't gorge as risk of acidosis. Can buy in bulk and fill water troughs allowing cows access to the troughs as they leave the shed, however dangerous if cows hungry as individual cows will gorge. Milking OAD is an option to save time and reduce stress on people. OAD milking decreases immediate milk production by approximately 20% in early lactation with the yield loss increasing to 30 (and up to 50% in heifers) as the duration of reduced milking frequency increases up to 10 weeks. Milking OAD has a carry-over effect on the potential milk production for the season. This increases the longer the time cows are milked OAD as shown in Table 2 below, with the effect being significant if employed for periods longer than 3 weeks.